The Hans Merensky Golf Club lies in a subtropical paradise in the Limpopo Province. 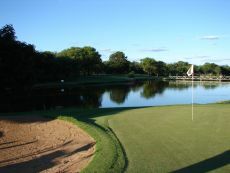 The hilly course was opened in 1967 and has since then been maintained very well, with intensely green fairways and several enchanting water features. Because the golf course borders in the east directly on the Kruger National Park, one can not only play golf here, but also observe a lot of game, e.g. various antelopes, giraffe, elephant, buffalo, hippo and crocodile. Even lions have been sighted on the course. The game arrives usually early in the morning and late in the afternoon to drink at the waterholes. Golfers should only move around the course in a caddy to avoid unpleasant encounters. provides an authentically African experience. The 8th hole (par 3, 155 metres long) is particularly attractive. The green is guarded by a water obstacle, where crocodiles live. Each year a tournament of the South African Vodacom Tour is being played here. 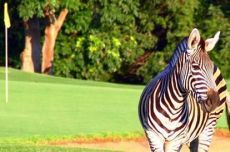 DescriptionAt Hans Merensky you have the opportunity of playing on one of the top 20 golf courses in South Africa while viewing the abundance of wildlife that frequents it. This golf course is a real must for any golf fan that loves the bush. The course, which shares its entire eastern border, and was once part of the Kruger National Park, is centrally situated in the Valley of the Elephants. A fence generally prevents the animals from roaming onto the course but the wildlife is able to enter via the clubs private game reserve to the south. 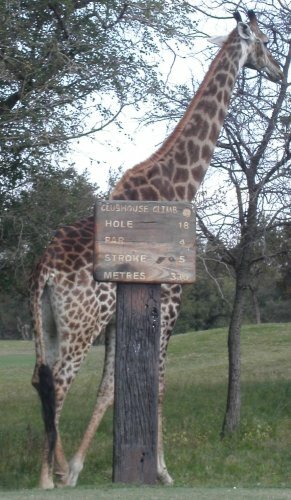 Don’t be surprised if you stumble across a giraffe determined to share the fairways with you and join your golf party! During a round at Hans Merensky it’s common to see elephant, giraffe, warthogs and all sorts of buck crossing the rolling fairways. Playing through is not an option when the pin is being blocked by a seven-ton elephant. It’s better to just wait! A golfer playing on this golf course not only has to navigate the large waste bunkers and bushveld trees that line the fairway but also needs to watch out for moving hazards. All this adds to the golfing safari experience.Water hazards are just that at Hans Merensky! With Live Crocodiles and Hippos, water hazards are really not the place to go searching for misdirected balls. Swallow your pride and take the penalty! This is a very playable course for all skill levels. We were particularly impressed by the two par 38th and 17th. We suggest you clear the water first and then worry about the bunkers that surround the greens.